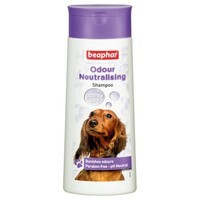 Beaphar Odour Neutralising Shampoo is designed for all dogs to keep them smelling fresher for longer without causing any irritation. This PH-neutral based shampoo is specially formulated to restore and strengthen the fur, leaving your dogs coat looking healthy and shiny. Particularly suitable for smelly dogs.